Every experience in our life, was designed to shape us into the ultimate and greater version of ourselves. But we don’t always have that wisdom and enough patience to see this sooner. We mostly focus on the pain and disappointment instead. “What doesn’t kill you will make you stronger. It may also help by trying to be positive. When bad things happens, and we start to have all those bad thoughts, try to pause our thoughts for a while, and think of all the blessings we already have in your life. Maybe these points can help? Channel it out in a good way. Talk to a trusted person, go for a jog or exercise to release it. Believe it. Somewhere around this world, other persons are facing the same difficulties as you. Don’t ever think you are the unluckiest person. This can help you get out of a self-victimizing mindset. Don’t be afraid to seek for help. Yes, you do. For example, you are not happy with you current work, or your team member annoys you, or your boss doesn’t appreciate you, or a group of people harass you – think for a while that you can always get out of this situation, instead of just keep on complaining and be frustrated towards them. You may not be able to control what happens to you, but you can always control how you behave, or how you decided to act towards them. Instead of asking why, it’s better to ask “What’s the best way to solve this?”. This will trigger your mind to come out with actions — which creates empowerment & possibilities — and in the end creates results. Being frustrated isn’t going to solve anything, action does! There’s always a solution to every problems. Even if the result isn’t what you expected, start from there. Time and faith will get you through it, no matter how. See obstacle as an advantage. Turn it to your advantage. The obstacle will eventually makes you stronger, more skillful and more experienced. The end result will put you ahead from where you were, which means that you actually benefited from the experience. There are always something you can learn from any situation. In any case, you will probably do it better and faster than you did the last time. “Someday, everything will make perfect sense. So for now, laugh at the confusion, smile through the tears, and keep reminding yourself that everything happens for a reason. yes! thanks for this good article. sometime I always ask why why and why when things not going my way. I don’t believe in that anymore, honestly, especially after my accident. I don’t think things happen for a reason because it feels like we leave too much to chance and that shouldn’t be it, at least in my mind. I think just that bad choices can be made along with good and consequences happen, good or bad depending. There isn’t a reason why most of the time. I think it’s not about leaving things to chance. It’s more about accepting the state of things and work out from there. 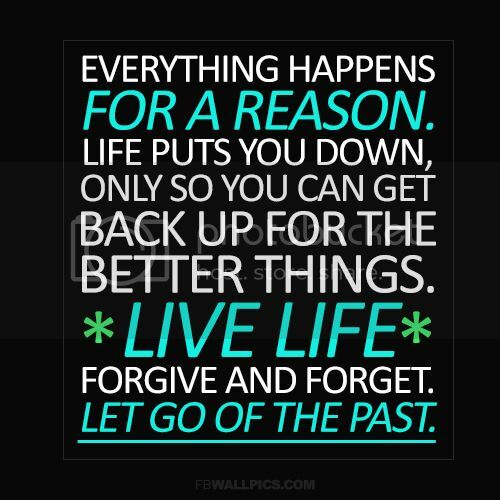 I have also made many bad choices and had to live the consequences.. It’s not that great, but instead of just being unhappy about it, i should be more positive and resolve the situation. I’m also talking through experiences. Some of the things took years until I realize “oh wow, there’s actually some good reason this thing happened”.. I can see what you mean, but having been in an accident still hasn’t gained me any insight as to having it happened for a reason. It didn’t have to happen and yet with someone’s bad choices, it did. I agree that you have to accept and learn from it, but it doesn’t mean that it happened for a “reason”.